Twitter is not only a convenient way to consume daily news and converse with friends online, it has become an excellent platform for gaining insight on what’s important at any particular moment in time. 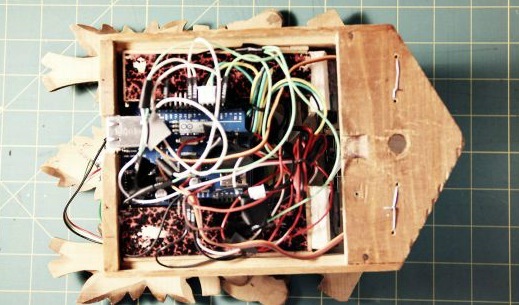 With this in mind, Maker Chadwick John Friedman has decided to harness the social network’s data into web-connected physical representations with the help of Arduino and Temboo. 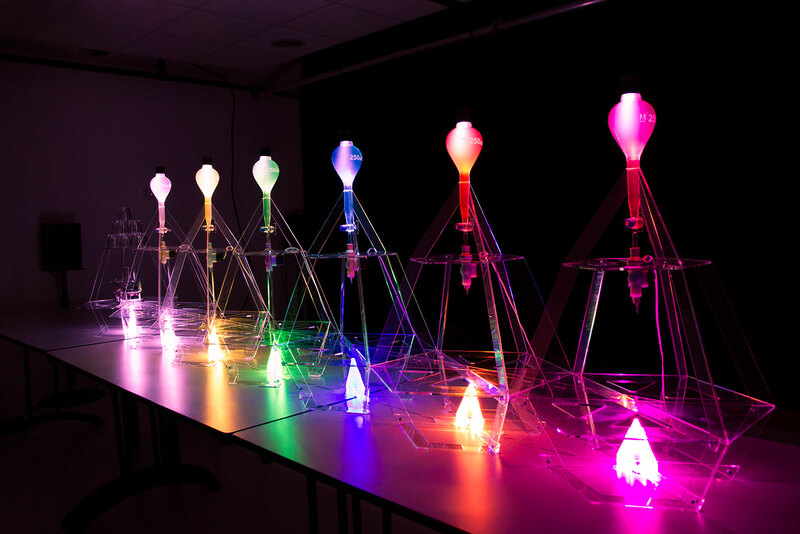 PrecogNation uses three 3D-printed geometric masks as real-time sci-fi future forecasters, which illuminate and change colors to reflect sustainability trends throughout the world. 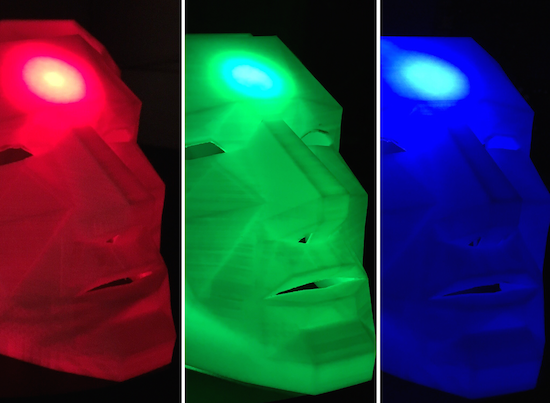 The three geometric 3D-printed masks are wirelessly connected to the Internet via an Arduino Yún. 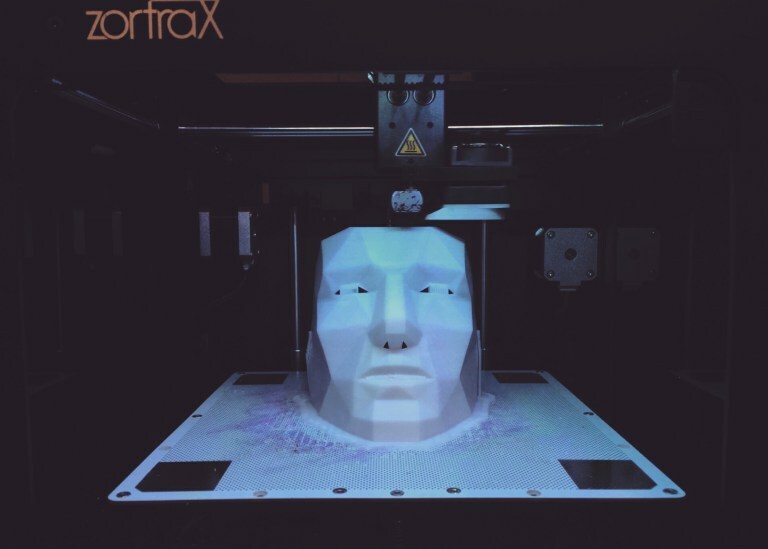 The masks were printed using a Zortrax 3D printer and white Z-ABS filament. The masks are a remixed version of Stephen Kongsle’s “Low Poly Mask.” Each mask took approximately 16 hours to print. The masks are constantly scraping data from Twitter in real-time via Temboo Choreos. Temboo assigns special API keys for Arduino devices that allow the user grab real-time data from Twitter that would otherwise be difficult to gather. That live data is then fed to the Arduino Yún, which illuminates a specific 10mm super bright LED, connected to the masks. One of the largest challenges in representing this overload of data physically was finding the correct terms and/or keywords that activate a specific color/thought in the Precog’s faces. The three colors present in the faces are scraping the Twitterverse for terms relating to sustainability, environmental threats, and political involvement. 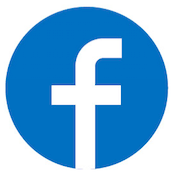 PrecogNation has its very own Twitter account, which allows the masks to scan through data specifically submitted by sustainability related users, corporations, and initiatives. As seen in the video below, progress in sustainable development (green) is represented by keywords such as renewable energy, clean coal, water treatment and wind turbines. Threats to sustainability (red) include deforestation, global warming, record heat, extinction, pollution, pandemics and so on. Meanwhile, blue denotes an overload of data and contradicting results. The overload of data in the color blue works like this… say the word ‘polar’ is found, but then the words ‘melting-polar’ are found, followed by the words ‘polar bear.’ This is an unreadable thread of information – it’s not really giving us threats or progress related to sustainability so the face reflects the color blue to signify that confusion. Coming up with the correct terms to represent the overload of information was especially tricky, and writing the code to reflect that confusion was equally as challenging. I eventually found a series of keywords and demands that elicited the response I was hoping for in this category. It is important to highlight the fact that although the colors red and blue may be perceived as negative (and usually appear more than the color green), they also mean that there are discussions about those negative sustainability issues happening every time those colors are activated. This is, in fact, a positive outcome, as one of the main goals of this project is to highlight the importance maintaining a dialogue – even if that dialogue surrounds daunting threats to sustainability. It is important that the masks provoke a highlighted continuation of focus surrounding social and political sustainability issues. You can read all about the project on PrecogNation’s page. 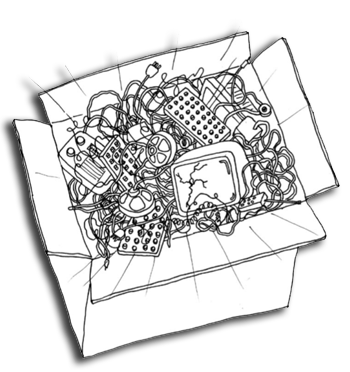 The internet of things is this strange marketing buzzword that seems to escape from the aether and infect our toasters and refrigerators. Now even a hamster is not safe. [Mifulapirus]’s hamster, Ham, was living a pleasant hamster life. Then his owner heard about another hamster named Sushi, whose running wheel stats were broadcasted to the internet. Not to be left behind, Ham’s wheel was soon upgraded. Now Ham is burdened by the same social pressures our exercise apps try to encourage us to use. No, we are most certainly not going to tell our friends about two fourteen minute miles with a twenty minute coffee break in the middle, MapMyRun, we are not. The feat of techno enslavement for the little hamster was accomplished with a custom board, an esp8266, and an arduino as described in the instructable. The arduino can be left out of the project now that the libraries have been ported to the esp8266. A hall effect sensor detects when the 3D printed hamster wheel is spinning. If you’d like to check in on Ham, the little guy is alive and well, and the twitter is here. It looks like it’s been upgraded since the original article was posted. Now it shows when Ham is awake and running around the cage doing hamster errands. How to turn data into cocktails! Data Cocktail is a device which translates in a tasty way the Twitter activity and running on Arduino Due and Arduino Pro Mini. When you want a cocktail, the machine will look for the five latest messages around the world quoting one of the available ingredients. These messages define the drink composition and Data Cocktail not only provides a unique kind of drink, but it also prints the cocktail’s recipe along with the corresponding tweets. Data Cocktail was created in a workshop held at Stereolux in Nantes by a theme composed by Bertille Masse, Manon Le Moal-Joubel, Sébastien Maury, Clément Gault & Thibaut Métivier. A first application, developed in Processing, pilots the device. 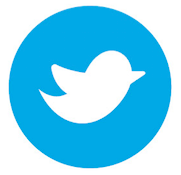 The requests are performed using the Twitter4J library, then the application processes the data and controls the device, i.e. the robot, the solenoid valves and the light. The robot itself is based on a modified Zumo frame, an Arduino Pro, a Motor Shield and a Bluetooth module. The solenoid valves and the LEDs are controlled by an Arduino Due connected via USB. The impression is realized by Automator. To prepare a cocktail, the machine can take up to a minute and may provide up to 6 different ingredients! 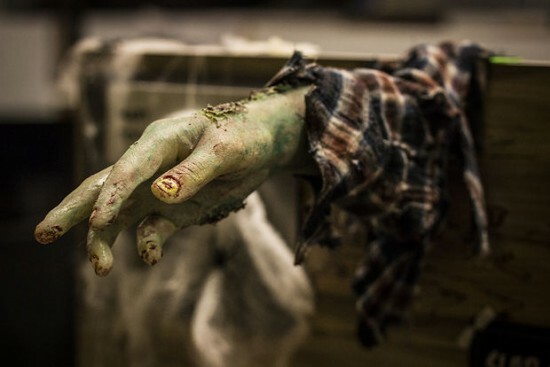 Slap my zombie hand for internet fame! 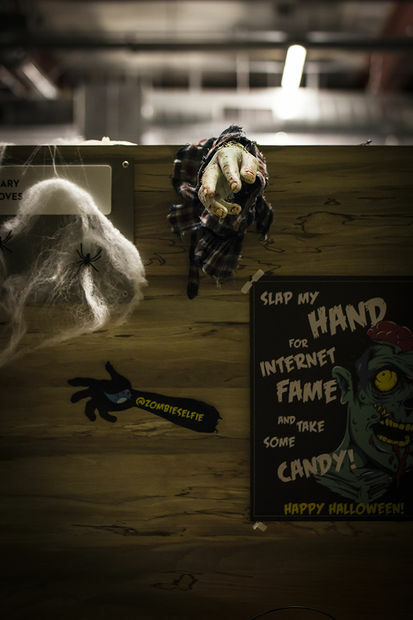 Halloween time is a great moment to explore nice interactive projects and get inspired for installations for other selfie occasions. To spice up the office Donnie Plumly, a creative technologist, decided to make and share with us a molded zombie arm that takes pictures and post them to Twitter. 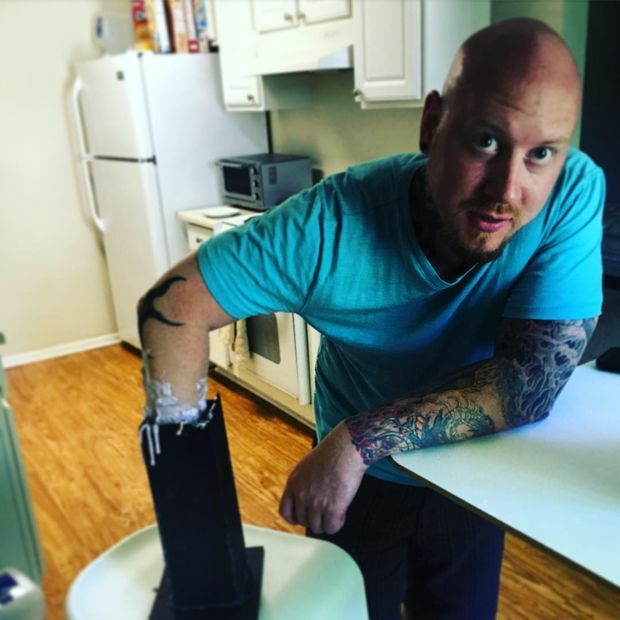 He used a silicone arm (molded on his own hand ), a custom steel mount to clip to an office partition, and a vibration sensor hooked up to an Arduino Uno. Once the arm is slapped a photo will be taken using an IR Led and passed to the Eye-Fi card in the camera. The photo is then saved into a Dropbox folder and, using If This Then That (IFTTT), posted to Twitter on the account @ZombieSelfie. 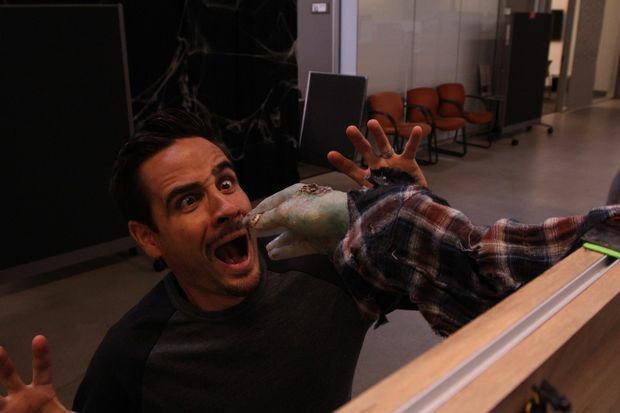 Donnie created also a very useful tutorial on Instructable to make it yourself! [Ashish] is bringing office warfare to the next level with a motion sensing water gun. Not only does this water gun automatically fire when it detects motion, but it also takes a photo of the victim and publishes it on Twitter. This hack began with the watergun. [Ashish] used a Super Soaker Thunderstorm motorized water gun. He pulled the case apart and cut one of the battery wires. he then lengthened the exposed ends and ran them out of the gun to his control circuit. He also placed a protection diode to help prevent any reverse EMF from damaging his more sensitive electronics. The new control wires run to a MOSFET on a bread board. [Ashish] is using a Lightblue Bean board as a microcontroller. The Bean is Arduino compatible and can be programmed via low energy Bluetooth. The Bean uses an external PIR sensor to detect motion in the room. When it senses the motion, it activates the MOSFET which then turns on the water gun. [Ashish] decided to use Node-RED and Python to link the Bean to a Twitter account. The system runs on a computer and monitor’s the Bean’s serial output. If it detects the proper command, it launches a Python script which takes a photo using a webcam. A second script will upload that photo to a Twitter account. The Node-RED server can also monitor the Twitter account for incoming direct messages. If it detects a message with the correct password, it can use the rest of the message as a command to enable or disable the gun. A local architectural heritage project spawned a wider interest in railways and roundhouses. One of the related technologies of railways in the 19th century was the telegraph. Having acquired an old telegraph sounder, we wondered if it could tap out Twitter messages. 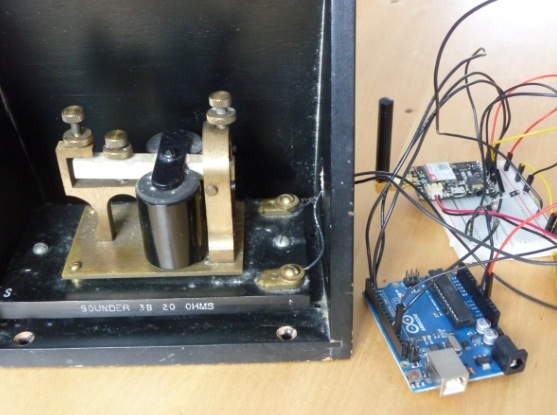 An Arduino UNO was used to test and control the telegraph sounder. The coils on the telegraph were tested with power drawn from the Arduino’s 3.3V and 5.0V pins. Momentarily powering the telegraph from the Arduino confirmed that the coils still worked, and the device made satisfying clicks in response from the electromagnetic action of the coils. With it confirmed that the telegraph is still operable, the Arduino UNO was then used to control the sounder. Mark Fickett’s Arduinomorse library was a quick route to controlling the telegraph in Morse code timing. Using that library, string characters are converted into Morse code, and a digital pin on the Arduino goes high and low, as if to turn an LED on and off. That pin became the control pin for the telegraph, and simple circuit was built using a transistor, resistor and diode to control the telegraph without damaging the Arduino’s digital pins. This circuit is common for connecting relays to Arduinos. The final step was adding an Adafruit FONA to the Arduino. The FONA connects to cellular phone networks, and the Arduino UNO can interact with it by sending and receiving actions to and from the FONA. In this case, the FONA connects to the cellular network and the Arduino checks the FONA periodically to see if there are any SMS messages available. If there are, the Arduino starts to read through them, convert them to Morse code, and tap them out on the telegraph. The completed device can be operated from batteries if necessary, providing operation anywhere a cellular signal can reach. The cellular connection provides wireless connectivity with the FONA handling the connection, rather than the Arduino. 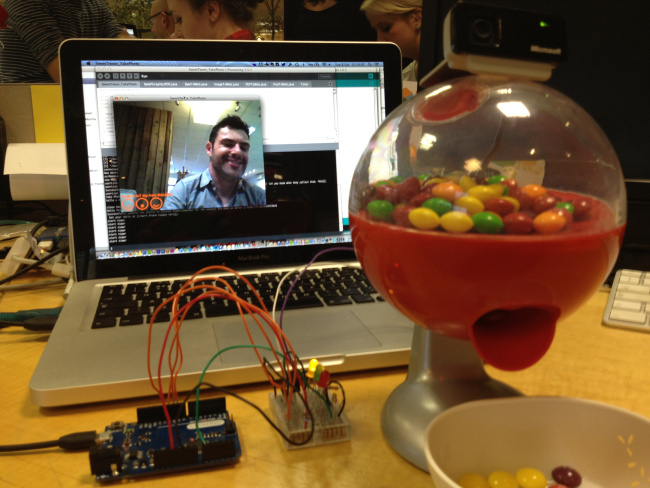 To package it up, the Arduino UNO and FONA were attached to a piece of acrylic. That board was then mounted under the telegraph sounder’s resonator. Four holes were pre-existing in the resonator’s base and used for mounting, so no permanent alterations were made to the historic components. Wouldn’t Tweeting in Morse Code be More Like “Pecking”? arduino hacks, art tech, communication, devon elliott, sounder, telegraph, tweet, twitter, twitter telegraph Commenti disabilitati su Wouldn’t Tweeting in Morse Code be More Like “Pecking”? If you find yourself glued to social media and also wish to know Morse code… we can think of no better invention to help hone your skills than the Twitter Telegraph. This vintage to pop culture mashup by [Devon Elliott] is a recent project that uses a sounder from the 19th century to communicate incoming tweets with dots and dashes. Back in the day when everyone was connected by wire, the sounder was a device on the receiving end of the telegraph which translated the incoming signal to an audible clicking. Two tall coils sat with a metal tab teetering between them. When electricity surged into one of the coils it would magnetize, pulling the tab downward in a pattern which mimicked the incoming current sent from the other end. [Devon] decided to liberate the sounder from its string-and-two-can origins and use a more modern source of input. By adding a FONA board which comes equipped with a SIM card, the device was capable of connecting and receiving data from the Internet. An Arduino is responsible for taking the data received and translating it into Morse code using the Mark Fickett’s Arduinomorse library, and then sending it out through an I/O pin to the sounder itself to be tapped. The finished project is connected to a cellular network which it uses to receive SMS messages and tweets. 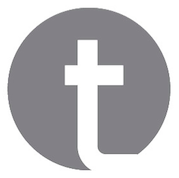 By mentioning the handle @ldntelegraphco you can send the Twitter Telegraph your own message which will be tapped in code for everyone in the vicinity to hear… which is worth giving a try for those of you curious types. Lastly, if you have an interest in taking a look at the code for your own use, it is available on [Devon’s] github. 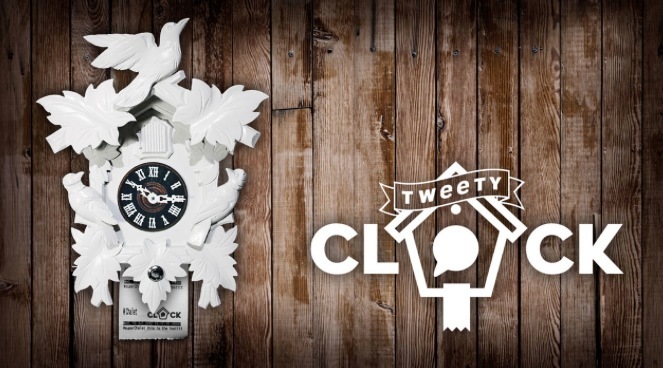 Johannes Hoffmann is an interaction and graphic designer sharing with us his hand-made Tweety Clock. It’s a vintage but interactive Twitter clock , built with Arduino and Ethernet Shield, and featured with the original ‘cuckooo’ sound and a little printer for the output. Arduino is checking if there are new tweets from a specific Twitter-Account. If so, the “bird servo” starts to rotate and the bird-door opens. Then the two “sound servos” brings the Cuckoo Clock flutes to sing and the bird nod with his head. Simultaneously, the thermo printer prints all new tweets. Click and take a look at his website, with many other pics and list of components. Funny thing is that this project didn’t start out involving sweets at all. Originally, I had planned to use NFC cards to allow people to quickly tap in, have a picture taken and then manipulate that image once it was on the server. Somewhere along the line I must have gotten hungry!